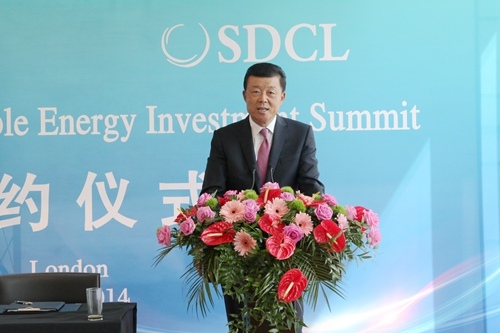 It is a real pleasure for me to join you at UK-China Sustainable Energy Summit. I warmly congratulate AVIC and AVIC International UK on your success. Today is indeed a red-letter day of ‘double-happiness’ for you! The first happiness is the completion of the Spriggs Farm solar project. In March last year, AVIC purchased Spriggs Farm. After more than one year of development and building, the project has been formally delivered and smoothly transferred. The success of this project is a prize for your hard work over the past year. The second happiness is that today AVIC will sign with Sustainable Development Capital Ltd (SDCL) an MOU on cooperation in energy conservation and emission reduction. This shows that you are not complacent about the current success and look forward to greater achievements. This also shows that you are upbeat about Britain’s open investment environment and will continue to ‘till the fields’ of the British energy market by marshalling AVIC strengths in technology, manufacturing, project development and management. I also offer my congratulations to AVIC British partners on your wise choices. First, you have chosen a good partner. AVIC is a top-notch product and service supplier committed to ‘going beyond commerce for a better world’. Second, you have chosen a rewarding project. I am sure that Spriggs Farm will yield high economic and social returns. Third, you have chosen a promising sector. New sources of energy represented by solar energy have clear advantages. They are green, clean and sustainable. They point to the future of the energy industry. · Firstly, it has created a successful new model of China-UK business cooperation. Spriggs Farm is the first BT commercial project carried out by a big Chinese company in Britain. 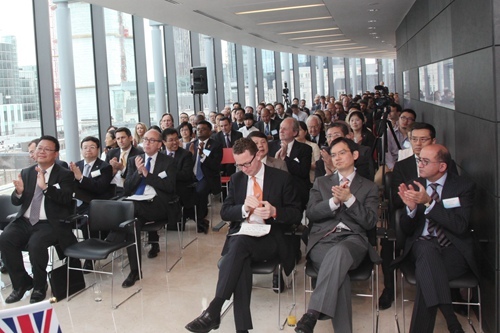 · Secondly, it fully reflects the thriving cooperation between China and Britain in the energy sector. Our two countries already have considerable mutual investments in the petro-chemical industry. We are now actively discussing and preparing for cooperation in nuclear power. We also have extensive cooperation in PV, wind farm and tidal power. · Thirdly, this MOU fully demonstrates the in-depth China-UK investment cooperation. Recent years have seen a surge of Chinese investments in Britain. They are growing in size and in numbers of projects. Moreover, sectors of investment have also noticeably expanded to include advanced manufacturing, finance, new energy, infrastructure and real estate. In conclusion, I once again congratulate AVIC and its British partners and wish all of you more fruitful cooperation in the future. I hope that with closer cooperation you will help China and UK with greater advancement in new energy, energy conservation and environmental protection. I also hope that together you will make greater contribution to China-UK relations.